Sharon Zalsos Banaag and Aris Banaag. I n May 1998, as the reigning Miss Maui Filipina, I gave a farewell speech to an audience of over six hundred and fifty people who were attending the 1998 Miss Maui Filipina Scholarship Pageant being held at the Maui Arts and Cultural Center’s Castle Theater. I told the audience how excited I was to be joining the United States Air Force and leaving for Basic Military Training later that year. I flexed and made the audience laugh and reassured all of them that I would not shave my head as Demi Moore did in the movie G.I. Jane, which was released earlier that year. The audience burst into laughter. Armed with excitement, enthusiasm, hope, and having been raised by a very strict Filipino mother, I was ready for the military. It’s twenty years later and the dust has now settled from the 2018 election season storm. Many are ready for the upcoming holiday and retail season that starts with Thanksgiving, features Black Friday and Cyber Monday, and culminates with Christmas and the New Year. But for me, the most important holiday is Veteran’s Day, on the eleventh day of the eleventh month of each year. In 1998, I signed to serve the U.S. Air Force for four years active duty. My basic military training was at Lackland, Air Force Base (AFB) in San Antonio, Texas while my specialty training was at Keesler AFB in Biloxi, Mississippi. Basic Training is not easy by any means. Not everyone is cut out for the military. Growing up in an environment where discipline was the order of the day, however, made Basic Training bearable. In those months spent in training by the best Air Power in the world, I realized what I was capable of. I experienced the power of perseverance and strength in the midst of personal trials and challenges. I was a little on the heavy side when I entered the service. 130 lbs. at 5’ 2″ in height. I couldn’t finish one push up and I barely jogged two miles in thirty-five minutes. To pass basic training, I had to run two miles in no more than twenty minutes, complete twenty-seven push-ups in one minute, and complete fifty sit ups in one minute. Knowing full well that I did not want to spend any more additional time in Basic Training if I washed out because of a failed physical training, I did twenty push-ups and fifty sit-ups before my head hit the pillow each night. This was the case for the next five weeks. I would add ten more reps to each form every week. When the sixth week came, it was do or die for me. I finished my run at 18.5 minutes (yes, barely passing), did over fifty push-ups in one minute, and another sixty-five sit ups in one minute. Small victory. Thanks to having to march everywhere every day, my weight dropped from 130 lbs. to 109 lbs. in less than six weeks. What’s up KETO Diet?! Then again, I was also only nineteen years old. After the necessary training, I was sent to McChord AFB in Tacoma, Washington as my permanent station. When I arrived on a cold, rainy night on January 7, 1999, I was greeted by a lady Senior Airman with short red hair. Big smile and smelled like cigarette smoke. Seattle was freezing and wet that night. I thought the city could be pretty if I could only get pass the cold. I started to miss Maui. I wanted to go back home to my family and enjoy my nice warm bed in my nice room. Ah, the exciting four years of active duty in the Armed Forces begins! When opportunities came my way, I made sure I grabbed a hold. Very rarely would I let any pass me by. I volunteered for events and met so many people. I even auditioned to sing the National Anthem at the 1999 Air Show at the McChord AFB. I got the part of course and I sang that beautiful song in front of a 100,000-plus crowd, covering the entire flight line runway, while two airbornes parachuted down from a helicopter holding the U.S. Flag for all too see. It was a sight to behold. I also learned how to network and make connections. I left the main personnel (HR) squadron and transferred to a squadron (made up of 350 plus personnel). I moved to the 62nd Aerial Port Squadron, where I worked for the Commander Support Staff. Because my job was behind the desk and no room for adventures really, I made it a point to volunteer to cross train and learn other specialties. I took short trips with our guys and learned about dropping supplies to training areas in Washington. Sorry, I can’t name the areas. The morning of September 11, 2001 changed our world forever. It was a typical 5 a.m. routine for me. 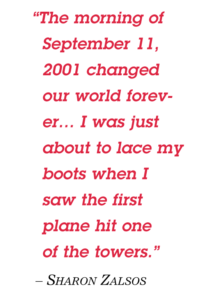 Brewed coffee, tucked in my black t-shirt in my battle dress uniform then known as BDU (or camouflage green), and I was just about to lace my boots when I saw the first plane hit one of the towers. News replayed in disbelief and confusions. I was confused. I thought it was fake until the second plane hit. Then everything moved slow for me. I called my Dad right away. It was 5:30 a.m. in Washington State so you can just imagine what time it was back in Pā‘ia, Maui. I woke my Dad and asked him to turn on his TV which he did. He didn’t go back to sleep. I reported to our base which was a twenty two minute drive away. Everything was turned upside-down. It was no longer a typical day. This was the beginning of war. I finished my four-year active duty and was honorably discharged. I fulfilled my commitment. Because I was only a permanent resident at the time, I was not held to the same requirement of an automatic four years of reserve time after active duty. I was free to be a private citizen. This was the time when then-President George W. Bush signed a law allowing uniformed personnel to earn their path to citizenship if they served in the U.S. Armed Forces. The country needed soldiers. Prior to my discharge in September of 2002, I already began my application papers for U.S. citizenship. I was sworn in as a citizen of the United States, the country I served, to earn my right of passage. I always felt that earning my citizenship was the way I wanted to pursue to be an American. The easier route would have been to apply as a green card holder but my way meant a lot more to me. Both having been in the U.S. Military Forces brings deeper meaning to Sharon and Aris’ rmarriage. 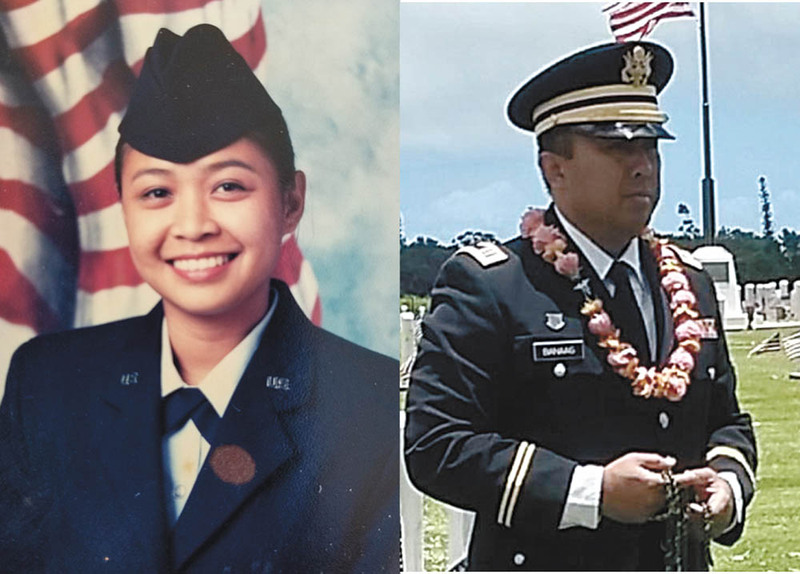 Today, my husband, Captain Aris Banaag, and I celebrate Veterans Day together as a military family. My husband is currently serving in the Army National Guard. I am humbled every day to know I am in partnership with a soldier. He is an incredible leader in his own right. He has been with the military for over twenty-six years. He served in both the U.S. Air Force and the U.S. Army. It is such a blessing to understand and speak the same military language that my husband now speaks. Having experienced it myself, I can understand and relate to this part of his world. As a member of the National Guard, he was recently deployed to the Big Island to assist during the Kīlauea volcano eruption. Earlier, the National Guard was also called to Kaua‘i to assist in the Kaua‘i North Shore flood recovery. Other members of the military assist the community in so many ways such as Tropic Care Maui County which since 2011 has provided free medical, dental and vision care in the summer. Military personnel continue to be active in the community once they retire and receive “Veteran” status. 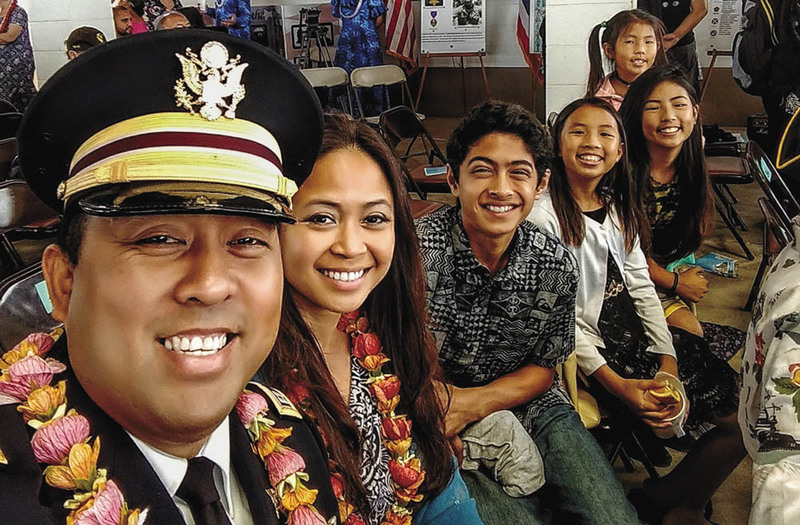 Many Maui Filipino-American veterans came back to Maui to make a difference. One such island boy is Vince Bagoyo, Jr. He joined the Army National Guard from 1971 to 1977. Bagoyo is president and owner of V. Bagoyo Development Group LLC. He served as Vice President of Castle & Cooke, Inc. on Lāna‘i from 1993 to 2003. He helped direct the strategic planning of Lāna‘i’s commercial and residential development, transitioning from a predominantly pineapple industry into a world-class vacation destination. He also served as a Maui County Council member from 1991 to 1992; as Director of the County of Maui’s Department of Water Supply from 1984 to 1990; and as a Director of Housing and Human Concerns from 1982 to 1984. He served on the Department of Health Environmental Advisory Council, Hawaiʻi Community-based Economic Development Board, Maui Community College Provost Advisory Council, Kiwanis Club of Maui (President 1986–1990), and Maui Homeless Shelter Fundraising Committee, among others. In Maui’s Filipino community, Bagoyo served as President of the Maui Filipino Community Council in 1992 where he helped in the planning and negotiations with Alexander & Baldwin for the donation of the land where the Binhi At Ani Filipino Community Center now stands. 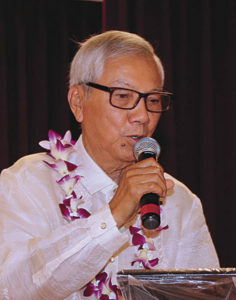 Bagoyo became the first President of Binhi At Ani and he chaired the Maui Filipino Centennial Celebration, coordinating a yearlong event and festivities in 2006. Virgilio “Leo” Agcolicol is another Maui Filipino American veteran. Agcolicol was drafted to serve the U.S. Army in March of 1969. He married the love of his life Virgie Agcolicol in January of 1970 and deployed to Vietnam shortly right after. He was out of the service by 1975. Agcolicol arrived in Hawai‘i in 1967 and worked at the sugar fields farmed by Wailuku Sugar Company. Shortly thereafter, he worked for Central Pacific Bank where he worked his way up the corporate ladder and retired after a 40+ year career. He was the first Filipino to serve on the Maui Arts and Cultural Center Board (since 1997), the Maui Memorial Hospital Foundation (2000 to 2002), the J. Walter Cameron Center Board (since 1995), and the Salvation Army Advisory Board (1994 to 1996). Agcolicol is very active in the Filipino community and served as President of the Maui Filipino Community Council from 1979 to 1981. He was heavily involved when the Council pushed for reforms of the controversial treatment and conditions of farmer trainees from the Philippines. Agcolicol has twice been named the Outstanding Member by the Council. He remains ever so dedicated to maintaining the positive image for the Filipinos in the community both on Maui as well as in the State of Hawai‘i. Agcolicol served as president of the United Filipino Community Council from 1982 to 1984. He also was president of the Maui Filipino Chamber of Commerce and received its Gintong Pamana Award in 1996. Agcolicol was also known in the radio world with his program Liwliwa Iti Agsapa, which had a running span of 40 years! He was the familiar voice for the morning commuters off to work at the fields or to commercial centers throughout the islands. To this day, Agcolicol still very much enjoys serving as a master of ceremonies and engage audiences for local events and private parties. Another Maui nui veteran was the late Rogelio “Roger” Evangelista. Evangelista was a disabled Vietnam veteran. He was also the president of the Maui County Veterans Council and served on the State Advisory Board on Veteran Services. You may well have seen him sign waving on the side of the streets or highways. For years, he advocated for countless issues concerning the lack of the appropriate services to our veterans right here on Maui. Evangelista was vocal in his dismay with the Maui VA Clinic’s staffing issues back in 2008. Make no mistake however, Evangelista’s countless efforts also paid off in some areas. Evangelista brought the military to be part of the yearly Barrio Fiesta celebration held during the Memorial weekend. The Veterans Memorial Day Service at the Annual Barrio Fiesta includes a special service honoring the prisoners of war and all our fallen who gave the ultimate sacrifice and never made it back home. Evangelista fought to keep this annual tradition in memory of our fallen military service men and women. Another milestone for Evangelista was seeing his efforts pay off when Maui County finally opened the Maui Veterans Highway or Route 311 (formerly Mokulele Highway). The highway runs south through the isthmus of Maui from the town of Kahului and nearby Kahului Airport, Maui’s international airport, to Kīhei, a distance of approximately seven miles. Yes, folks, this is now a reality so please, if you haven’t already, start calling the highway by its new name, the Maui Veterans Highway. Chelsea Ann Fernandez (Evangelista) on deployment. Another Evangelista has taken over in place of Roger. The young Chelsea Ann Fernandez (Evangelista), who is married to Army veteran Joey Fernandez. Together, they have three, beautiful children, Shae-la Ann, 19 years old, Joey Jr., 10 years old, and Colby, 8 years old. Chelsea was born and raised in Hilo and moved to Maui in 2005. She entered the United States Army Reserve in March 2001. She enlisted as a 51B, carpenters/masonry specialist, joining the 411th Engineers, Combat Battalion unit in Hilo. Like many others who enlist in the military, Chelsea had the desire to see and experience the world. Another perk that appealed to her was the thought of having her education paid for by the military. Chelsea’s family has a long history of the military service. Continuing on this family legacy to serve in the armed forces was a no brainer. Beginning with her grandfather who served in the Korean War 1950–1953 while other family members served in the Vietnam War 1955–1975 and the Gulf War in 1990–1991. Chelsea’s basic training began in Fort Leonard Wood, Missouri and Fort Jackson in Columbia, South Carolina. She went on to train for her Military Occupation Specialty [“MOS”] at the Naval Construction Battalion Center in Gulfport, Mississippi. She was deployed with the 411th unit while attached to the 1st Calvary division stationed in Baghdad Iraq in 2004. 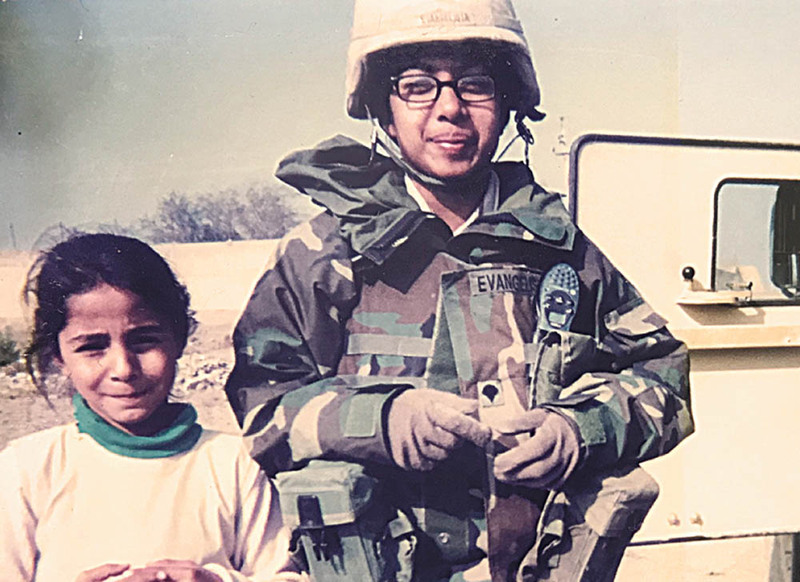 Her platoon served a separate mission in Sadr City for a few months. When Chelsea was asked what advice, she would give her younger self, she responded, “I don’t think I’d say anything to my younger self. Although there were rough times I’ve faced over the years, I think those things helped shape me into the person I am today and made me into a stronger person. If I had to do it all again, I think I’d want to go the exact same way it went.” For our current younger generation, this is what our veteran Chelsea advises: “To those who are thinking about joining the military, even if you just have a little bit of sparked interest in joining, join. And while you’re in, do all the training that you can. If there are extra courses, job trainings or schools, take those opportunities and complete them. And if given the opportunity to lead, take it. Those skills that you will gain will help you so much when you decide to finish your military career and go back into the civilian workforce. If you’d like to gain skills, want the opportunity to serve others and the desire to do something great to uphold the values that we uphold in the military through our warrior ethos: I will always place the mission first. I will never accept defeat. I will never quit. I will never leave a fallen comrade… then you should be joining our ranks! It is incumbent upon each of us to teach the next generation to honor all those who answered the call of duty, served and fought to protect and defend the United States against all enemies, foreign and domestic. “I am an American soldier. Having earned my path to American citizenship, I continually work to protect and defend this incredible nation. This beacon of hope, justice and pursuit of happiness. I love what America stands for and I love my fellow warriors past and present. I will forever be a member of an elite group of men and women who provide a blanket of security for our people’s way of life. Being a veteran is a badge of honor I wear proudly each and every day of my life. But there are those who served our country who never received full Veteran status. Sherman Baisa served in the Army National Guard from 1961 to 1966. He was part of the 29th Infantry Company C., based right at Kahului Armory, next to McDonald’s in Pu‘unēnē Avenue. He is the son of Cirilo Ranesis Baisa of Badoc, Ilocos Norte and Rachel Lahela Kikiwi of Kaupō, Maui. Baisa entered the Maui Police Department in 1966. But unfortunately in those days, if you joined the police ranks, you couldn’t keep serving in the Army National Guard. There was no law protecting the employment security of our weekend soldiers. After working with the Maui Police Department for fourteen years, he stayed in the County and worked for the Department of Water Supply for the next eighteen years and retired. Due to an older regulation, Baisa, although he served in the Army National Guard, was not afforded veteran status. His older brother Freddy, who served for over twenty years in the Army National Guard, also did not qualify for Veteran status. Although a recent law was signed giving official veteran status to National Guard members who served twenty years or more, this new law still doesn’t qualify Sherman (or his 90 year old brother Freddy) to veteran status, as most of Sherman’s time from the Army National Guard was spent right here on Maui and annual training on O‘ahu. Another group of forgotten Veterans are the 260,000-plus brave Filipino soldiers who fought side by side Americans during World War II. When World War II broke out, then-President Franklin D. Roosevelt issued a presidential order which called the Philippine Commonwealth Army into the service of the Armed Forces of the United States, promising full veteran benefits to Filipinos for their service of fighting side by side Americans to defeat the Japanese. But after the war, Congress passed the Rescission Act of 1946, which cancelled President Roosevelt’s order and the Filipino Veterans, who were U.S. Nationals, were disqualified from receiving the same rights, benefits, and privileges as others who served under the U.S. Armed Forces. The rationale provided by the U.S. Congress in 1946 was that the United States gave the Philippines two hundred million dollars ($200,000,000) after the war. Although Congress passed the American Recovery and Reinvest Act in 2009, providing for a one-time lump sum of $15,000, for the surviving veterans who are U.S. Citizens, and a $9,000 lump sum settlement for non-citizens, it was not enough. Eligible people had one year from the time of passage of the bill to file claims and only $198,000.00 was set aside for these payments. My Lolo was from Southern Philippines and he was not notified in time to meet the one-year time limit. Although Congress decided in 2016 to award the Congressional Gold Medal of Honor to these Filipino veterans, in my humble opinion, it was too little, too late. Despite our country’s shortcomings, especially with respect to Veteran’s issues, when called to serve, I would do so again in a heartbeat. When I see or hear any dishonor made to our flag or our nation’s song, it is a knife that pierces straight into my heart, as if a personal attack on what I help build. But it is also a reminder to me, that it is those very same acts of unkind and at times, disrespectful gestures that makes America truly great. Freedom is real and it is not biased.